What’s Behind China’s Denial of Forced Organ Harvesting? (Minghui.org) The Chinese state-sanctioned forced organ harvesting from prisoners of conscience, including Falun Gong practitioners, became a focus of media attention during the 26th International Congress of The Transplantation Society in Hong Kong from August 19 to 23, something the Chinese government did not expect. Dr. O’Connell said to the Chinese speakers at the convention,“It is important that you understand that the global community is appalled by the practices that the Chinese have adhered to in the past,” according to The New York Times article. On August 18, the evening before the convention began, two Chinese state-run associations held a special session on organ transplantation in China. The speakers at the special session included the former Chinese health minister, Huang Jiefu, and the director of the hospital affiliated with Zhejiang University, Zheng Shusen, two top figures in the Chinese organ transplant community. Surprisingly, or maybe not, the only reporters allowed in the special Chinese session were from the Chinese state-run newspapers and TV stations and a few Hong Kong pro-communist media. The next day, more than 20 Chinese media told the world the same story: This special Chinese organ transplant meeting showed that the Chinese organ transplant world had been truly accepted by The Transplantation Society, and former health minister Huang Jiefu vehemently denied the accusation leveled by the international community against Chinese forced organ harvesting. A New York Times article on August 17 covered the heated argument over Chinese forced organ harvesting before the convention. Several human right organizations and physicians wanted to boycott the convention, because some speakers were suspected of being involved in the forced organ harvesting, including Huang Jiefu and Zheng Shushen. A group of physicians and ethicists published an article in the American Journal of Transplantation, criticizing “the decision to hold the conference in China as premature” according to The New York Times article “Debate Flares on China’s Use of Prisoners’ Organs as Experts Meet in Hong Kong” on the 17th. More than 10 papers submitted to the convention were rejected because of the unclear sources of organs. The director of the hospital affiliated with Zhejiang University, Zheng Shusen, was invited to speak, but his speech was cancelled, and his paper is under investigation. Zheng missed the opening ceremony and returned home before the meeting started. At the press conference on August 19, Dr. Jeremy Chapman, the former president of the Transplantation Society, said that Zheng’s paper may have violated the society’s rule that no organs from executed prisoners be used in research, although Zheng’s name was not mentioned. Falun Gong practitioners hold a protest outside the conference venue. In June 2016, three independent investigators from Canada and the U.S.—David Kilgour, David Matas, and Ethan Gutmann—published a 680-page joint report on the state-sanctioned organ harvesting in China. The report estimated that 60,000 to 100,000 organ transplant surgeries have been conducted in China every year, the majority of which used organs from Falun Gong practitioners. Zheng Shusen’s own experiences offer indirect evidence to support this accusation. Zheng Shusen, 66, is one of the most experienced liver transplant surgeons in China. According to the state-run publication Guangmingwang and the China Association for Science and Technology, Zheng has carried out 1,850 liver transplants as of March 2016. According to an article on the website of his institute, the Center for Liver Transplants, on January 28, 2005, Zheng once performed 5 liver transplants in one day and 11 total in that week alone. Zheng told the media in 2006 that, from 1992 to 1998, there were only 78 liver transplants in the whole country, but this number has increased dramatically since 1999, which coincides with the beginning of the persecution of Falun Gong in 1999. What stands out in Zheng’s experience is “liver transplants for acute hepatic failure” (LTAHF), which refers to patients who must get a liver transplant within 72 hours or die. Based on the data from Zheng’s research papers published in 2005, his institute carried out 46 LTAHF procedures from January 2000 to December 2004. Since this kind of transplant cannot be pre-arranged, it is extremely rare in Western countries. However, among 4331 cases listed in the official Chinese Report on Liver Transplant Registration in 2016, 1150 were LTAHF procedures, 40% of the total! The large number of LTAHF cases is considered strong evidence of the existence of organ harvesting from living people in China. It is noteworthy that Zheng is the chair of the Provincial Anti-Cult Association in Zhejiang Province. One of the major functions of this state-run association in the last two decades has been to aid and abet the persecution of Falun Gong. Zheng himself has been actively involved in slandering and vilifying Falun Gong. He was the chief editor of a book published in 2009 that defames Falun Gong. Although Zheng never revealed the source of his organs in his papers, his role in the anti-Falun Gong campaign certainly suggests a convenient source of organs to supply the immense organ transplant industry in China. (Minghui.org) A joint subcommittee hearing titled “Organ harvesting: An examination of a brutal practice” was held by the U.S. House Committee on Foreign Affairs on June 23, 2016. Several witnesses gave testimony that the Chinese Communist Party (CCP) conducts live organ harvesting from Falun Gong practitioners at the scale of genocide, and that the heinous crime is exceedingly cruel. He indicated that their newest investigation report shows that the Chinese regime’s forced live organ harvesting from prisoners of conscience is continuing at an alarming scale. “Falun Gong practitioners, a peaceful and respected Chinese movement, continues to suffer greatly at the hands of the CCP,” said Rep. Rohrabacher. “They are victims of forced organ harvesting.” Under the efforts of human rights advocates, journalists, and investigators, the CCP’s atrocities are becoming known to the world. 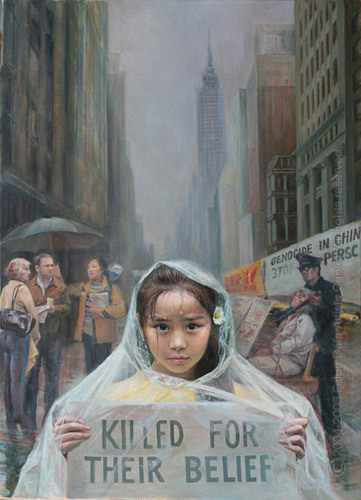 U. S. House Representative Chris Smith said, “The Falun Gong repression is especially brutal, ugly, and vicious. I strongly believe that the 17-year-long campaign to eradicate Falun Gong will be seen as the biggest shame in recent Chinese history.” He commented that the organ harvesting by the Chinese regime and doctors is reminiscent of what happened in Nazi concentration camps during World War II. He indicated that it was a little discouraging that more people aren’t coming forward to investigate the perpetrators in the persecution of Falun Gong and organ harvesting, but that this will change. (Minghui.org) A screening of the documentary film Human Harvest: China’s illegal organ trade was held in the British Parliament for the first time on November 4, 2015. The film was honored as the best 2015 International Investigative Documentary by the Association of International Broadcasters (AIB), and has received the prestigious Peabody Award. Human Harvest follows Nobel Peace Prize nominees David Matas and David Kilgour as they investigate the atrocities of illegal organ harvesting in China, particularly of Falun Gong prisoners of conscience. They estimate that 40,000 to 60,000 people have been killed for their organs in China. The film has been shown in over 20 countries to great critical and audience acclaim. A Lord of the upper house said the film was “Stunning” after watching it. He also wished to know whether the organ harvesting atrocities still continue. Daisy Arcilla Brett-Holt, Chair of Worldwide Philippine Jury Initiative PH &UK, watches the film in the UK Parliament at 1 pm on November 4, 2015. Daisy Arcilla Brett-Holt, Chair of Worldwide Philippine Jury Initiative PH &UK, had been a teacher in Philippine, UK and Nigeria. She watched the film in the UK Parliament on November 4. (Minghui.org) The BMJ (formerly the British Medical Journal), a weekly peer reviewed medical journal, published a blog entry entitled, “China’s semantic trick with prisoner organs” on October 15, 2015, by K. Allison, et al. The authors pointed out that, “The term ‘death-row prisoners’ organs’ to which Huang referred is different from the common definition of prisoner organs. The announcement by Huang refers to the intention to stop the use of organs illegally harvested without the consent of the prisoners. If ‘consent’ is obtained, organ procurement from executed prisoners is legal according to current Chinese laws. “These prisoner organs procured with ‘consent’ are now classified as voluntary donations from citizens. The re-defining of prisoners as regular citizens in this context is facilitated by the fact that there is currently no law in China that distinguishes prisoners from regular citizens for organ sourcing. “However the use of ‘voluntarily donated’ prisoner organs in China continues to violate international ethical guidelines. It is a fundamental principle in transplant medicine that organ donations must be made voluntarily, which in turn requires autonomous, informed decision making. Even with ‘consent,’ using organs from prisoners is not acceptable: prisoners are neither free from coercion nor always fully informed, nor able to freely consent, nor are their families. The authors pointed out, “After repeated past unfulfilled promises from China, such as the Chinese Medical Association letter to the WMA in 2007, and the failed Hangzhou Resolution in 2013, announcements alone, without subsequent legal actions and without verification that those respective laws are implemented, should not be regarded as satisfactory by the medical community.